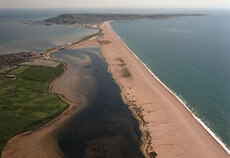 Chesil Beach is 18 miles (28 kilometres) long and, on average, 160 metres wide and rises to 12 metres in height. It is a pebble and shingle tombolo connecting Portland to Abbotsbury and then continuing north-westwards to West Bay near Bridport. It is the largest tombolo in the UK. The pebbles are graded in size from fist-sized near Portland to pea-sized at Bridport. The pebbles are mainly a mix of flint and chert, with some quartzite pebbles from Buddleigh Salterton. The origin of the beach continues to be argued over with some proposing it is actually two beaches. The stretch from West Bay to Abbotsbury appears to have different characteristics to the stretch from Abbotsbury to Portland. Chesil Beach shelters Weymouth from the prevailing wind and waves and prevents the area being eroded by wave action. Evidence suggests that the beach is no longer being replenished by natural means. 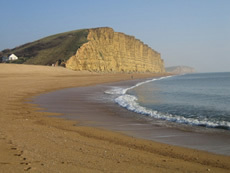 The beach forms part of the Dorset and East Devon World Heritage Site, known as the Jurassic Coast. It is above all an elemental place, made of sea, shingle and sky, its dominant sound always that of waves on moving stone: from the great surf and pounding “grounds of seas” of sou’westers, to the delicate laps and back-gurgling of the rare dead calm….